The City of Houston, Texas, in association with four regional water authorities, is expanding its Northeast Water Purification Plant (NEWPP) from 80 mgd to 400 mgd, dramatically increasing its ability to support steady residential and commercial growth while reducing dependency on groundwater. The Houston Waterworks Team, a joint venture between CDM Smith and Jacobs Engineering, was awarded the contract through a competitive bidding process. Construction is currently underway on this 90-acre site, the largest progressive design-build project of its kind in the United States. 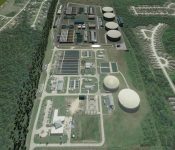 Carollo Engineers, Inc., the owner advisor on this multi-phase project, serves as an extension of staff to facilitate effective project planning and execution. In this role, Carollo is responsible for project management and controls including cost estimating, scheduling, collaborative-delivery analysis and selection, analysis of the City’s contract, procurement procedures and documents, risk management, technical oversight, and negotiating the project’s guaranteed maximum price. Carollo is also responsible for all aspects of construction contract administration and management. 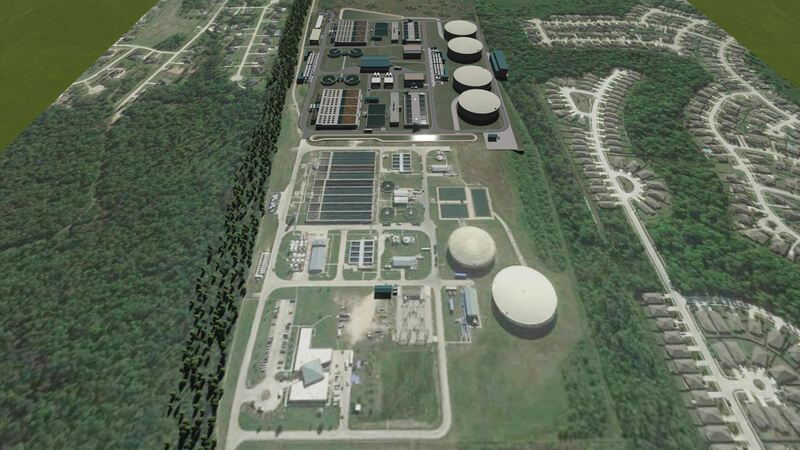 As part of the expansion, the Houston Waterworks Team is designing and constructing a new raw water facility, including intake, pumping, and conveyance to withdraw raw water from Lake Houston and deliver it about 1.5 miles away to the expanded NEWPP. The raw water from Lake Houston is challenging to treat because it is “flashy,” meaning the water quality characteristics vary widely due in part to the lake’s shallowness. During rain events, the turbidity, organics, and alkalinity of the water change drastically. These changes make the water difficult to treat with a single treatment process alone. To address these challenges while meeting the City’s goals, the team is delivering significant water supply innovation. The NEWPP expansion is required to comply with subsidence district rules for conversion from groundwater to surface water supply. Features of the project include the design, construction, and commissioning of an intake pump station, twin 108-inch transmission mains, pre- and post-treatment chemical addition, flocculation and sedimentation basins, ozone treatment, filtration, finished water storage tanks, and a high-service pumping station. 1. The largest progressive design-build of its kind in North America. The project entails notable quantities and firsts, including: over 1 million cubic yards of earthwork; 200,000 cubic yards of structural concrete; 4 million construction man- hours; 1,400 created jobs; and the largest installation of 40- inch diameter dual purpose centrifuges at any water treatment plant in the United States. 2. Design-build is helping to solve project challenges. The DB team is working together to solve treatment challenges such as raw water quality and a smaller facility footprint to preserve space, cost, and construction time. 3. Approach to procurement and subcontracting. The team’s design-build experience, as well as knowledge of the Houston construction community, will help the City achieve lower construction costs. Our informed bid package strategy, with transparent and competitive bid processes, provides local Houston contractors a level and competitive playing field to compete in their field. Balfour Beatty was selected as best value for the North Plant Package. They are under contract for the concrete foundations of the Phase 1A critical structures, with the contract for the balance of the North Plant expected to follow. This work is a piece of the NEWPP Early Work Package 6 (EWP-6) which also involves McCarthy Building Industries, Inc. as the general contractor on raw water intake, GAC filter, transfer pump station, and post-treatment chemical facilities. 4. Design-build approach allows the project to be implemented in phases to meet City’s funding/budget requirements. The project will be implemented in phases, with the first phase increasing the capacity of the NEWPP from its present 80 mgd to 160 mgd in 2022, and the second phase increasing the overall facility production capacity to 400 mgd by the end of 2024. Early work construction packages are underway to assist the HWT in achieving the contract required production milestones.